Bethesda Softworks held its first-ever E3 press conference this year, and it went over really well. 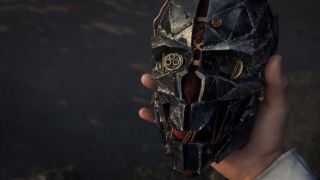 But that doesn't necessarily mean there will be another one; Vice President of Marketing and PR Pete Hines told The Telegraph that 2015 "felt like the right time to do this kind of thing," but he can't say for certain it'll happen again. "I don’t know if we’ll do one next year," he said. "I don’t know if we’ll do one again." I'd be willing to bet that they will, but you can see where he's coming from: Bethesda had Fallout 4, Dishonored 2, and Doom to announce, and a couple of other games as well. That's an impressive lineup, and certainly not the kind Bethesda can bank on rolling out every single year. "We do smaller stuff, we don’t publish to scale, we try to publish to quality. Make sure everything we do is noteworthy," Hines explained. "Our approach to that hasn’t differed. Here and there we might change our approach to how it’s presented but we’ve still stuck to who we are." Interestingly, especially in light of the powerfully positive fan response to Fallout 4, he also said that he hopes E3 will maintain itself as predominantly an industry-focused event. He'd like to see it be "somewhat inclusive," but doesn't want it to turn into "another PAX." "We already have PAX, we already have Eurogamer, Paris Games Week and Gamescom and lots of shows that are for the public," he said. "I think taking a show that still has a very important role as a trade/industry event needs to maintain that. And not suddenly say, here’s another 20,000 fans to throw in. It’s already kind of a mess. There are already lines and it’s difficult to get around." If you missed Bethesda's E3 press conference, and you've got a couple hours to spare, we've got it playing for you above.